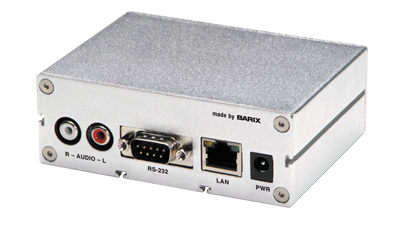 Audio over IP decoder with line-level audio outputs and USB flash memory interface, low power, multi-format (MP3/WMA/AACplusV2,PCM, Ethersound) support. The Exstreamer 100 | 105 IP Audio Decoder decodes and plays multi-protocol and multi-format audio streams, including MP3, AACplusV2, WMA, PCM, G.711, and Ethersound. It features a stereo line level output, headphone connection, and low power consumption. 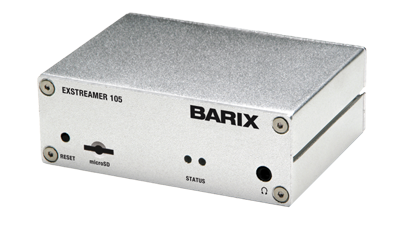 The Exstreamer 100 | 105 is a reliable IP-enabled audio streaming device which can be used in a variety of audio over IP applications such as local and internet-based IP music distribution systems, in-store audio applications, paging and announcement systems.